Abdurrahim Boynukalin, a Turkish Member of Parliament from the ruling AKP Party, leads a mob in front of the offices of Hurriyet newspaper, September 6, 2015. At right, the shattered windows of the building's lobby, after the mob hurled stones. Last year, after a pro-government columnist tweeted news about this author, referring to him as a "disgrace to humanity," several others joined the lynching on social media. "A sperm of Israel," someone wrote. Another said: "Enmity to Islam spills from his face." Someone else wished that I would travel to Gaza so that "the al-Qassam [Brigade] could shoot him right in the middle of his forehead." Another campaigner invited "this ignoble, inglorious Zionist leftover to leave for Israel." Someone else wished, "May he and his family be bombed." And yet another offered a DNA analysis from a photograph: "He must be either Armenian or Jewish." All that was the new normal in Turkey's increasingly militant, pro-Islamist media. Things are getting worse. On January 24, 1993, a bomb placed beneath his car killed Ugur Mumcu, one of Turkey's most prominent columnists and investigative journalists, who wrote for the daily Cumhuriyet. Mumcu was a secular leftist who persistently wrote on Iranian and Sunni Islamists and their clandestine operations in the Middle East, particularly in Turkey. Although a handful of Turkish operatives were brought to court for the Mumcu murder, the open-secret Iranian plot behind the assassination remains a mystery even after 22 years. By a simple twist of fate, many years after his father's death, Mumcu's son, Ozgur Mumcu, became a columnist for the same newspaper, Cumhuriyet. His September 5, 2015 column, entitled "Welcome Brother, Mr. Selahattin," looked like a columnist's welcome to a newcomer into the columnists circle. In the most sarcastic way, it was not. Mumcu was saluting Selahattin Es Cakirgil, a new columnist for the fiercely pro-government Star newspaper. Ethem Sancak, the wealthy owner of the pro-government Star newspaper, recently said that he was "in love with" Turkish President Recep Tayyip Erdogan. "You probably don't know him [Cakirgil]," Mumcu wrote. "But I do... as one of the suspects in my father's murder trial. And as someone with an arrest warrant from Interpol and the suspect in several political assassinations in Iran." In what must be a self-torturing sarcasm, Mumcu further wrote: "We say welcome to Selahattin Es. Of course, we should have expected that people like him should fill the ranks of columnists who have been murdered. He can only complain that this took so long." Star's owner is the wealthy businessman Ethem Sancak, who recently made headlines when he said that he was "in love with [President Recep Tayyip] Erdogan like Sems was with Mevlana," referring to the two medieval era Sufis. His extremely pro-government credentials are not disputed. Therefore, no one was surprised when another Star columnist openly threatened Ahmet Hakan, a columnist for the secular Hurriyet daily. Star columnist Cem Kucuk wrote of Hakan in his September 9, 2015 article, "Like schizophrenia patients, you think you are still living in the days when Hurriyet was running the country. We could crush you like a fly if we want. We have been merciful until today and you are still alive." Turkey is living proof that Islamism and press freedoms can only be an oxymoron. Implying that he is a religious person, columnist Kucuk later complained that his threatening piece was criticized by "fake religious people." Turkey remains a good laboratory proving Islamism and press freedoms can only be an oxymoron. 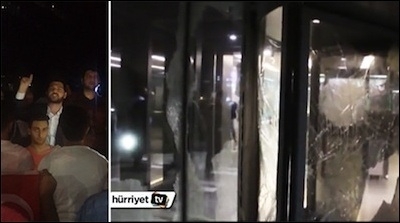 On September 6 and 8, 2015, Hurriyet's offices and printing works in Istanbul and Ankara were pelted with stones by hundreds of club-wielding Erdogan fans. Video footage from the September 6 attack shows a member of parliament from the governing AKP Party, Abdurrahim Boynukalin, leading the mob. In a fierce speech in front of the newspaper's building, Boynukalin vowed that the Dogan media company [which owns Hurriyet] will "get the hell out of Turkey" when Erdogan will have additional executive powers "whatever the electoral outcome on November 1 will be." Boynukalin was not unrewarded. 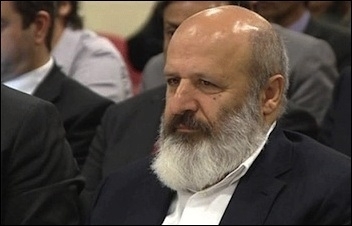 A few days after he made the headlines for leading the mob, Boynukalin was elected to the high council of the ruling Justice and Development Party (AKP) at the party's general convention. But the Boynukalin's anger toward Hurriyet is not calming down. New video footage shows him speaking to the same fierce mob that attacked Hurriyet. Referring to columnist Hakan and Sedat Ergin, Hurriyet's editor-in-chief, Boynukalin says: "They had never had a beating before. Our mistake was that we never beat them in the past. If we had beaten them..."
No later than 48 hours after the AKP's convention, the police raided the editorial offices of the Nokta magazine over a mocked-up "selfie" of a smiling Erdogan with the coffin of a soldier. The picture was a sarcastic criticism of Erdogan's recent comments that families of soldiers killed by Kurdish militants should be happy about their martyrdom. A prosecutor banned distribution of the latest edition of Nokta and ordered raids on its offices on charges of "insulting the Turkish president" and "making terrorist propaganda." Turkey's "Muslim Brothers" are making every sign that they have no intention of surrendering power through elections. Next, on September 15, prosecutors launched an investigation into the Dogan Media Group, Hurriyet's parent company, for "terrorist propaganda," following a widely derided front-page story in another staunchly pro-government daily, Gunes. In a written statement on September 7, after the first mob attack on Hurriyet, the International Press Institute (IPI) said "an important line has been crossed." IPI's Director of Advocacy and Communications Steven M. Ellis was right when he said, "The events of the last 24 hours mark a dangerous escalation in an already troubling campaign of harassment and intimidation targeting independent media in Turkey ahead of the Nov. 1 election." Turkey's "Muslim Brothers" are behaving just like Muslim Brothers elsewhere. They came to power through democratic elections. They are making every sign that they have no intention of surrendering power through democratic elections.